Buying land and building a homestead is easily the biggest thing we’ve ever undertaken (well…at least besides parenthood). It was a stressful process, but it wouldn’t have been if we had known this crucial information. If you’ve found the property of your dreams, make sure you do these FIVE things before you pull the trigger and buy it. First, make sure you’ve made the necessary financial preparations to buy a piece of property. If you haven’t, READ THIS ARTICLE to get your money under control so that you can focus on choosing the homestead property that is right for you. Second, make sure you know what to actually look for in a property by reading about homestead essentials HERE. After all, if you’re going to buy some land you should get some that will serve you well for years to come. 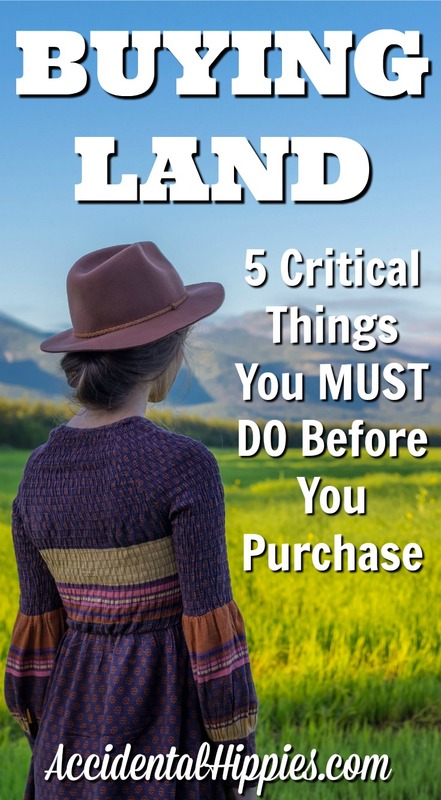 Once you’ve evaluated your money and have some land you want to purchase, be sure to do these five important things before you buy. 1. Visit the property and do a complete walk-through. This is vitally important, especially if you are not local to the area in which you intend to purchase. Even if you are 1000 miles away from your dream homestead, go visit it in person. It is not enough to simply trust your realtor to steer you in the right direction. If you want to be truly self-sufficient, YOU need to make sure the property is what you need and want. There were plenty of properties we pulled up online and fell in love with “virtually”. We’d look at the GIS maps and pore through the photos in the listing, thinking it was perfect. Then we’d drive to it and realize that it’s at the end of a rugged dirt road lined with falling apart trailers and probable meth labs (and yes, at least one was verified!). Or we’d discover that you can see and smell the landfill just across the valley. Or we’d realize that the topographic map was a little deceptive and didn’t really convey how hilly and wooded the land really is. Moral of the story: do not buy a property without going to it and walking it first! If possible, walk it with a copy of the plat. The owner of the property should also walk it with you, if possible. They will usually have a deeper knowledge of the boundary lines and landmarks, not to mention the history of a property and any neighborly disputes. We walked our property with the previous owner a couple of times and found tremendous value in it. In my experience, truly rural properties avoid unnecessary deed restrictions, but you may always encounter an exception. For example, the previous owner of our property wanted to make it into a subdivision but it never materialized. As a result, there was a restriction on our deed that any house must be over 1200 square feet. When we asked him about it he explained the situation and was more than happy to remove it for us. Even so, enforcement of a deed restriction isn’t hard and fast. Read here for more information. 3. Check on mineral, timber, water, and access rights. You need to know if your property comes with its mineral, timber, water, and access rights or if they have been sold off by a previous property owner. You may buy the property with or without them, but you need to understand the risks. We did have a mineral rights issue that could have ruined our plans to buy our property, but we were able to resolve it within the timeframe of our offer to buy without jumping any other legal hurdles. Your best course of action is to check with a property rights lawyer in your county and state to make sure you don’t jeopardize your dreams over legal technicalities. 4. Verify zoning and ordinances. If you want to build a house on your land, you need to make absolutely sure of what your property’s zoning type and associated ordinances dictate about what you can or cannot build. The same is true if you will want to add auxiliary structures like sheds, barns, tiny houses, wind turbines, solar panels, etc. There may be square footage requirements for permits, types of structures that are not allowed, boundary setback requirements, and more. Every state, county, and municipality is very different, so be sure to check with your local government(s) to ensure you don’t jeopardize a future building project on your homestead. Ours were available easily enough online through our county’s official website. Of course, deciphering the legal jargon in it is another matter. Be a careful and diligent reader! If you haven’t already evaluated the ways that you can finance your land, do that here. You also need to make sure you figure out exactly how you’ll be paying for and insuring your land once you start building on it. If you’re paying cash, make sure your money is secure and accessible so your transaction can go smoothly. What about land leases or owner-financing? Make sure you have signed any appropriate documents and have reviewed them with a lawyer or someone who is well-versed in these transactions in your area. The last thing you want is to lose the opportunity to buy your land because of lost money or shady business practices. I like the recommendation to check the zoning and ordinances to make sure you can use the land for what you need. It makes sense that some land would be much easier to build a house on while others are strictly for commercial, etc. It’s something I’ll have to keep in mind because buying dedicated house land could be beneficial in the licensing, etc. So many people forget about zoning and then run into trouble. We had to check on ours before we bought it because it actually falls under TWO different types of zones. All excellent advice! May I add one more? While you’re walking the property, look closely at small hills and valleys, knolls, etc on the property. I bought my nine acres a year ago and just recently found a 100′ diameter area above my creek that has eroded from the rain. Lo and behold, it’s an old town dump from the 70s! It’s probably been covered up with dirt on a regular basis, most recently by my previous owner. The DEC folks said they’ve found over 50 of them so far in my area of upstate New York. They said most of them are safe including mine, and there’s no leachate, but it’s pretty unattractive. Now I’m stuck with it. Oh my goodness!! I definitely would never have considered that. We saw plenty of properties NEAR commercial garbage dumps but I never would have thought about having an old one ON the property itself. Thank you so much for sharing! My husband and I are planning on buying some land that we can build our dream home on, and we are wondering how to go about it. So I like your tip to visit the property you are considering in person so that we can be sure it has everything we need and so that we can get acquainted with the area. We will definitely be sure to visit any land we are thinking of buying so that we can be sure that it is exactly what we are looking for. Hi, your blog posts are well written. Thank you. I also think that considering the plant growing zone that the land falls into is very important as it determines what type of trees, fruit trees, berry bushes, and kitchen garden plants you can grow. IT also is good to determine the weather patterns for your property and how rain and snow accumulate and flow through the property. As an example–a place on the property that snow normally creates large drifts will be a big plowing problem if it is on your main road of accessibility. Or if temporary small creeks form in large rainstorms in pathways of your planned structures or roads. These will incur extra engineering and construction costs to properly overcome. Excellent points! I address some of these in a different post about 18 things to look for in a homestead property here . It isn’t an all-encompassing list and there are always more things to consider of course, but I tried to hit some of the big ones. You presented some excellent points to consider…thanks for sharing them with us! I just came across a family that purchased a large piece of property her in Idaho. They thought they were purchasing 160 acres, when in fact they purchased land that was much less and in an entirely different location. Now they are in the middle of a law suit with the Real Estate Agency. So only work with someone You know personally and still only trust yourselves. Do you due diligence. That’s awful! I hope they resolve it easily. That is definitely a great example of doing your due diligence when buying property. Thanks for sharing with us! NUMBER ONE – PRAY AND WAIT –NUMBER 2 , WATER ! ! ! GOOD WATER AND PLENTY OF IT AND THAT IS HARD TO COME BY IN MANY LOCATIONS . DO A WATER TEST. IF YOU AINT GOT GOOD WATER ,YOU AINT GOT NOTHING ! ! ! SOIL TYPE -DO A SOIL TEST –UN FARMED DEEP SANDY LOAM IS BEST . LOCATION IS VERY IMPORTANT –LOOK AROUND FOR AT LEAST 3 MILES . LOCATION IS VERY IMPORTANT . -THE FARTHER YOU LOOK , THE BETTER. NUKE POWER PLANTS ? PREVAILING WINDS ? THINK ABOUT LIVING THERE FOR THE REST OF YOUR LIFE …50 MILES OR MORE FROM A BIG CITY ? HASTE MAKES WASTE -REMEMBER THAT ..-TAKE YOUR TIME -MISTAKES AND BAD DECISIONS CAN BE VERY PAINFUL . GOD BLESS AND GUIDE YOU -will . All good things to consider! I touch on some of those in this post here: 18 Things to Look for in a Homestead Property but didn’t mention soil testing. Good idea! Thank you so much for sharing. Thanks for the tip to visit the property in person and do a complete walk-through before purchasing it. My uncle wants to build a new home and barn for his family, so these tips will definitely help him find great land. I’ll be certain to share this article with him, as these tips have great reminders in them. I liked what you said about going there in person to get a feel for the property. I know that I would really be one of those people who would just want to make a decision based on pictures of the property. We’ve been considering buying some land and building our home on it for a little while and I think that it could really work. If we go this route, we’ll be sure to follow your advice and visit the land before we purchase. It’s good to know how to buy land properly. I like how you said that visiting it in person is a must, no matter what. We really want to own a small ranch that we can retire on, so I’ll remember what you said here! We’ll visit any potential land even if it’s miles away. My husband and I both grew up in a more rural area, and we’d like to go back out there and raise horses. So I like your tip to make sure that you visit the property in person to make sure that you can’t smell any landfills and make sure that the description has done it justice. Your tips will help us find a great horse property that we could get to make our dream come true. Thanks for that tip about checking the deed. I didn’t realize there were even more regulations to watch out for there! Is there any way to get a piece of land’s restrictions changed so you can build more on it? Thanks! We asked the property owner to change the deed restrictions and he did, no problems, but we’re extremely rural. HOA enforced neighborhoods are likely a no-go on that front. My husband and I are thinking of building a house. To do this, we’ll need to buy land. I appreciate the advice in this article, it’s very smart to check zoning and ordinances to make sure you’re aware of what you can and cannot build. I never thought that one can make an informed decision when buying land by walking on it with the owner. After buying one, my tip is to find a landscape preparation service before building the house’s foundation. With their help, they can help keep a land dry and solid enough so that the finished house will be sturdy. I’m a little late to this party but we’re looking for land in GA and have had a couple of those “Oh, dear! !” surprises. I’d like to add another potential to your list of gotchas . . . . chicken houses!! We found a piece of property when we were out driving around that we absolutely LOVED. It was right across the street from a wildlife preserve so we thought that would be ideal. Unfortunately, on the other side of the wildlife preserve was a commercial chicken raising operation . . . 7 houses!! Yes, a landfill does smell; it has nothing on a commercial chicken farm!! Thanks for your efforts. Love your website! Whoa! I’ve never had the privilege of smelling a commercial chicken operation but I can only imagine! Yikes! It reminds me of what my mom used to talk about from her childhood: their school was right next to an animal byproduct processing plant and she’d talk about the stench wafting over during recess and such. You never know what you’ll find next to a property! Thanks for sharing your experience with us! !